The Powermix Pro Popular is available in single auger models with capacities ranging from 9m3 to 15m3. The popular comes as standard fitted with one front right corner discharge door, a left rear corner discharge door can be specified as an option. Doors on the Powermix Pro Popular are wider than previous models, this increases feed out speed as well as consistency. Extensive testing has established that the natural exit points on the tub are the front right and rear corners, this coupled with the Populars large doors give exceptionally fast and even feedout even when chopping exceptionally dry and fluffy feeds. 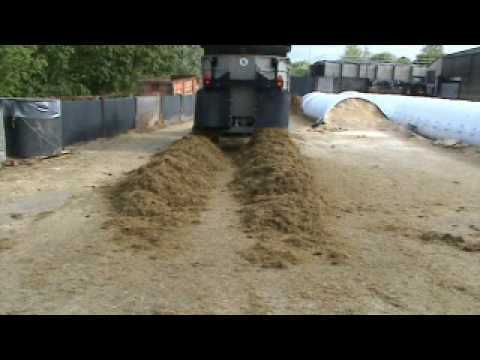 The Popular model is ideal for feeding into feed passage systems, floor feeding systems or for low fronted troughs, feed out rates are set by adjusting the height of the door opening to get the desired feed out rate matched to the forward speed of the tractor. The adjustable door feed out tray will feed over a 2" 7" barrier or 2' 11" barrier when axle riser blocks are fitted. The 2 door option allows you to feed from both sides of the Powermix feeder wagon without having to keep turning where animals are fed from both left and right in different sheds or for feeding both sides at once on drive through feed passages. Extensive testing has revealed that the natural tub exit points are the front right corner and left rear corner. Large doors gives fast , even controllable feed-out. For situations where it is necessary to elevate the feed into a taller trough an 3 feet long side mounted conveyor is available. This can be mounted on either side of the machine and will enable feed to be discharged over a 5 foot barrier. The conveyor is made from a single piece moulded rubber belt with cleats. The belt is driven hydraulically by cage rollers to prevent contamination. The conveyor is fitted with a hydraulic ram and can be folded flat to the side of the tub when not being used.